The American Old West was a vast landscape ripe for storytelling, since lawlessness prevailed and people were constantly traveling as the country was developed and expanded. The Western film genre is one that emphasized gunfights and cowboys, telling stories of good versus evil and unlikely outsiders taking on cruel institutions. There’s been no shortage recently of attempts to reinvent the genre and revisit some of its most common tropes, and, if nothing else, one recent effort, “Damsel” is different. Samuel Alabaster (Robert Pattinson) is a man in love. He seeks out the dilapidated Parson Henry (David Zellner), who spends much of his time passed out with a bottle in his hand, to help him find his kidnapped Penelope (Mia Wasikowska) and marry them after he kills the evil Rufus Cornell (Nathan Zellner). As Samuel demonstrates that he is not the type of man used to gunfights or any real outlaw living, surprising information is revealed that shows that the situation is not at all what it seems, much to the bewilderment of the eternally flummoxed Henry, who has gotten himself in way over his head. It’s difficult to say much more about this film without revealing its plot details, which serve as its sole real defensible asset. This film starts out as an intriguing look at a man not really fit for the West, who responds to insults about his lack of a manly drink choice by confirming that his stomach is weak and smiling far too much at everyone around him. Once things take a turn and Henry becomes the stand-in for the audience and their surprise, this film goes off the rails, delving far too deep into humor that isn’t all that funny and makes this into a very silly and unappealing experience. 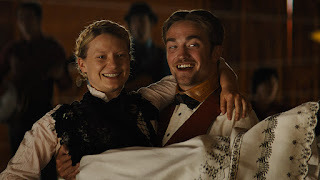 Regardless of the roles that they’ve been given, Pattison and Wasikowska are still good performers who do their best to make Samuel and Penelope into vivid protagonists, which they certainly are. It’s not their fault entirely that the film’s plot takes them in an unfortunate direction, focusing far too much on these director brothers as actors in a story that just isn’t interesting or entertaining. For a while at the start, it feels like it might be going somewhere, but it’s soon clear that, where this film is headed, there’s no good reason for the audience to follow.